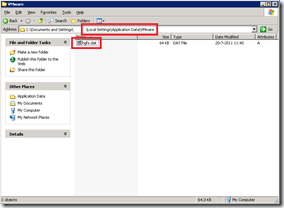 In a terminal server environment is common to use roaming (or mandatory) profiles. 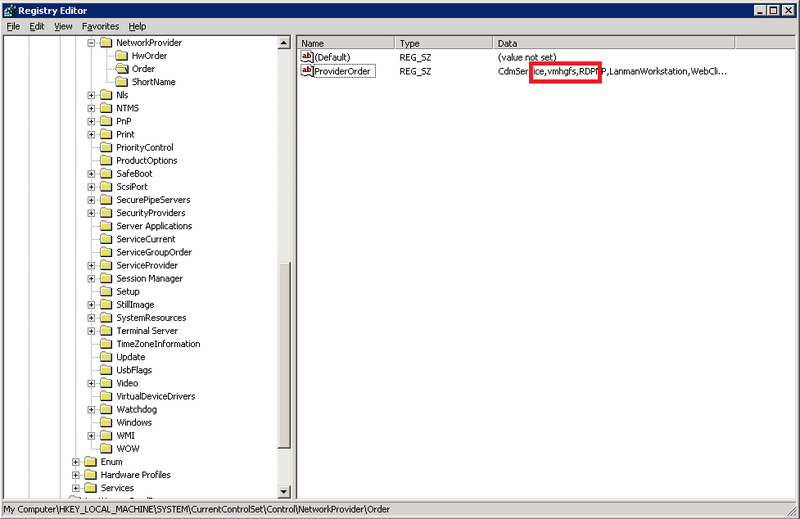 To prevent the system from bloating with unused profiles, the profiles are usually removed at logoff. Since the hgfs.dat is locked, this is prevented and the server might end up with many profile folders. In the event log the following events can be found. <strong>Event ID</strong>	1533 <strong>Source</strong>	User Profile Service <strong>Type</strong>	Error <strong>Description</strong>	Windows cannot delete the profile directory C:\Users\<username>\AppData\Local\VMware\hgfs.dat. This error may be caused by files in this directory being used by another program. DETAIL - The directory is not empty. <strong>Description</strong> Windows cannot delete the profile directory C:\Users\<username>\AppData\Local\VMware\hgfs.dat. This error may be caused by files in this directory being used by another program. DETAIL - The directory is not empty. <strong>Event ID</strong>	1000 <strong>Source</strong>	Userenv <strong>Type</strong>	Warning <strong>Description</strong>	Windows cannot copy file C:\Users\<username>\AppData\Local\VMware\hgfs.dat to <remotelocation>. Contact your network administrator. DETAIL - The process cannot access the file because it is being used by another process. <strong>Description</strong> Windows cannot copy file C:\Users\<username>\AppData\Local\VMware\hgfs.dat to <remotelocation>. Contact your network administrator. 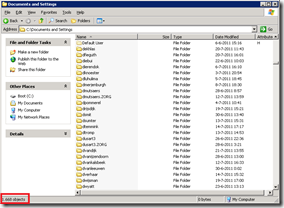 The problem can be solved by disabling the Shared Folder feature in VMware Tools. 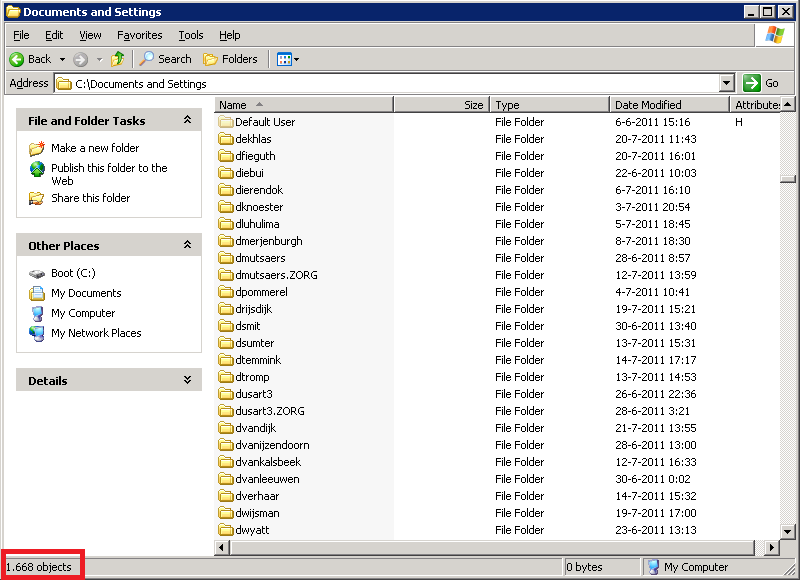 This has to be configured in the registry by removing the shared folder feature from the NetworkProvider. Access the Windows Registry. Choose Start > Run, then type regedit. The Registry Editor window opens. Right-click ProviderOrder and choose Modify. In the Edit String Value dialog box, edit the value data string and remove the word hgfs, vmhgs, or vmhgfs). If the value data string contains LanmanWorkstation,hgfs, LanmanWorkstation,vmhgs, or LanmanWorkstation,vmhgfs, change it to LanmanWorkstation. 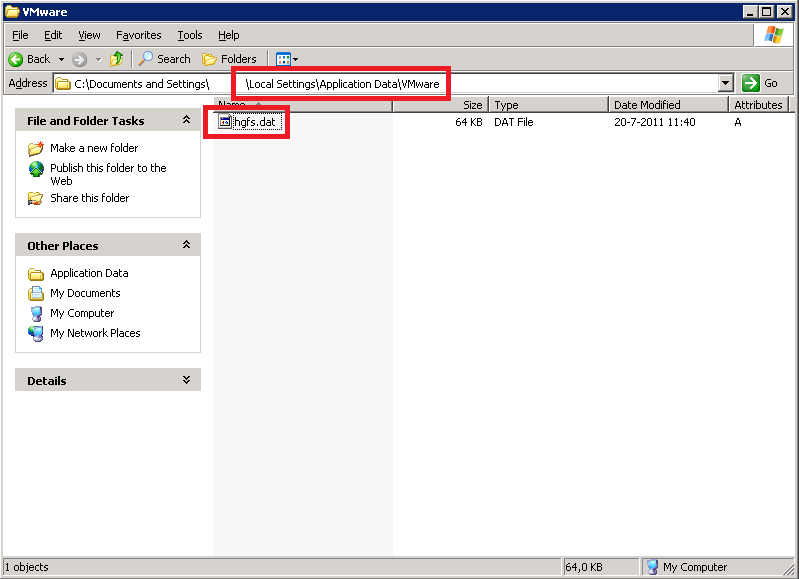 If the value data string contains only hgfs or vmhgfs, erase it and leave the value data string empty. Close the registry editor. Choose File > Exit. Instead of editing the value per server I created a small VBscript to deploy on all Terminal Servers. 'Define variables Dim objShell Dim strProviderOrder 'Connect to subssystems Set objShell = WScript.CreateObject("WScript.Shell") 'Read registry key strProviderOrder = objShell.RegRead("HKLM\SYSTEM\CurrentControlSet\Control\NetworkProvider\Order\ProviderOrder") 'Remove VMware Shared Folder strProviderOrder = Replace(strProviderOrder, "vmhgfs,", "", 1, -1, 1) strProviderOrder = Replace(strProviderOrder, "vmhgs,", "", 1, -1, 1) strProviderOrder = Replace(strProviderOrder, "hgfs,", "", 1, -1, 1) 'Write registry key objShell.RegWrite "HKLM\SYSTEM\CurrentControlSet\Control\NetworkProvider\Order\ProviderOrder", strProviderOrder, "REG_SZ"
The Script worked perfectly for me! Thanks for the article. Fixed my issue Citrix XenApp servers. 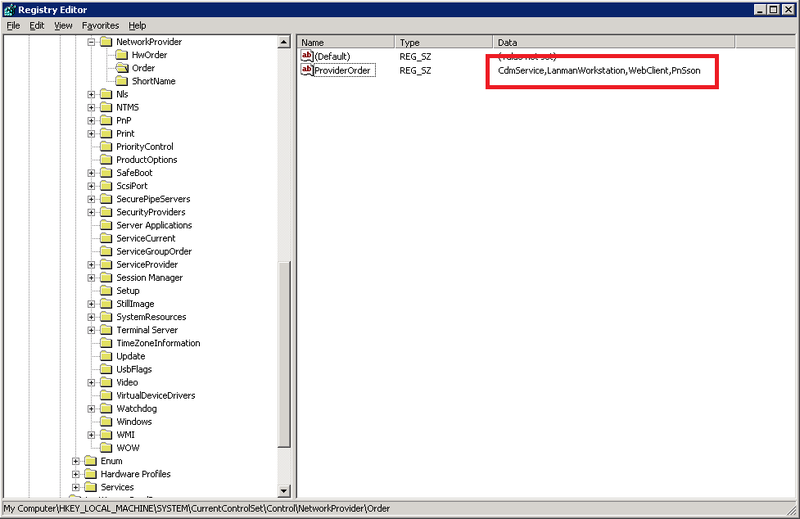 I found a CTX related article that mentions to go to add/remove programs and modify the vmware tools installation by unchecking vmware shared folders. VMware tools cannot be modified/change on my servers. Your fix helped as a work around. Good to hear the article helped! However, I’m still getting Profile Bloating. Any other suggestions? Are your profiles bloating or aren’t they removed after users logoff? These are two complete different problems (with different solutions).